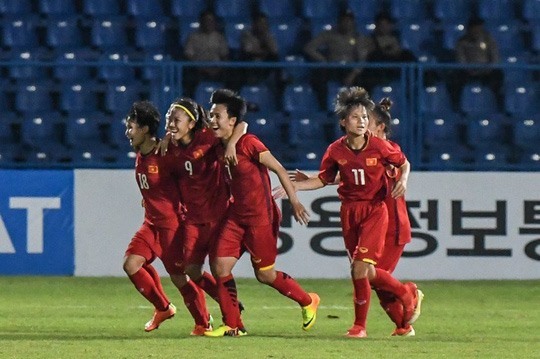 Việt Nam’s women beat Thailand 3-2 in their first match of Group C at the Asian Games (ASIAD) 2018 in Indonesia yesterday to qualify for the knock-out stages. Group C consists of only three teams, and after Thailand lost to Japan, the result confirms Việt Nam will progress. Thailand controlled the first half, but lost their cool in front of goal to allow Nguyễn Thị Tuyết Dung to open the scoring for Việt Nam in the 21st minute. Eight minutes later, Suchawadee Nildhamrong beat goalkeeper Khổng Thị Hằng from the penalty spot to level the game, but it was short lived and Nguyễn Thị Vạn restored Việt Nam’s lead just two minutes later. In the 40th minute, Nguyễn Thị Liễu got her name on the scoresheet to make it 3-1. Thailand fought back strongly in the second half and narrowed the gap in the 79th minute, but were unable to find the equaliser. Việt Nam will next face Japan on August 23.